It used to be that the only way you would be able to find out what was wrong with your vehicle would be to bring it to the dealer or a trusted mechanic. However, it is now possible to purchase a simple code reader for under $50 that will provide you with all of the information you need to get that “check engine” light taken care of properly. It’s a great little tool that can help you to save time and money that would otherwise be spent on going through a list of troubleshooting for common issues associated with the make and model of your vehicle. You can even save money that you might have spent on diagnostics with the local dealer or mechanic and take care of the issue yourself. LaCava Brothers carries a wide range of car parts and accessories that you can use for your American, European, or Asian vehicles. We also sell a diagnostic scan tool that you can use for most vehicles 1996 or newer. It reads and displays the Diagnostic Trouble Code (DTC) for identification and turns off the Malfunction Indicator Light (MIL), otherwise known as the check engine light. It will also erase the DTC trouble codes and reset the OBDII system. We have it on special right now at our auto supply and services in Fall River, MA for just $29.99 – you can see it right here on our website. Make sure to visit our Fall River auto parts and services store on Bedford Street. We have proudly served the local area for over 70 years and have a wide selection of car parts and accessories for both professional mechanics and at-home DIY repair services. It is important to understand that a diagnostic scan tool is just the beginning step to provide the services that your car needs. It provides you with a trouble code that you can use to help identify what’s going on inside your vehicle. The diagnostic scan tool sold by LaCava Brothers comes with a complete user manual that includes the most current trouble codes. The Malfunction Indicator Light (MIL) or check engine light is provided by the manufacturer to let car owners know that there is something wrong with the vehicle. It can indicate a wide range of issues, identified by a sensor somewhere in your engine. It could be about the engine itself or something in your transmission, exhaust, or another essential area of your vehicle. That’s why it is important to understand that the trouble codes are the key to figuring out what’s happening with your car. It might be something simple, or it could be something complex. In some situations, the light might turn on and off without any repairs being completed. That doesn’t mean that the problem “fixed itself,” so it is important to use a diagnostic scan tool to read the code and determine what the situation is that is occurring inside your vehicle. Instead of spending $75-100 for a professional diagnostic scan, you could purchase your own tool from LaCava Brothers and start figuring out what is going on with your vehicle. While you might ultimately still require professional services, this little tool can help you save valuable time and money on solutions that won’t make a difference. What are OBDI and OBDII? The more you know about the items you purchase at our Fall River auto parts and services store, the more you will be able to get out of them. You will see the terms OBDI and OBDII used with regard to diagnostics. The difference between these two categories includes cars that were produced after computerized controls and cars that were produced before computerized controls. Systems that were built prior to 1996 are under the OBDI category, while systems that were built in 1996 or later are under the OBDII category. It is important to choose a diagnostic scan tool that is designed for the make, model, and year of your vehicle for best results. You can still get OBDI diagnostic scan tools, but OBDII simplified the process and made it easier to identify issues according to a set of universal trouble codes. While some manufacturers might choose to create their own manufacturer-specific codes, an OBDII code reader, such as the one sold at LaCava Brothers can be used for any vehicle made after 1996. 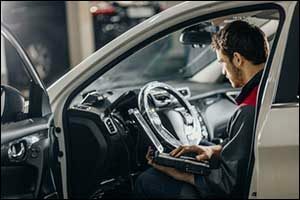 Just find the diagnostic connector for your vehicle, which is typically under the dashboard and to the left of the steering column. For the OBDI connectors, they can be found in a wide range of locations. Look up your make, model, and year of the vehicle for directions. Just follow the instructions for the diagnostic scan tool and use the trouble codes listed in the manual for best results. Stop by LaCava Brothers to see our full line of car parts and accessories or give us a call at 508-676-1951 to speak with a representative about the parts or products that you require. We can give you more information about our diagnostic scan tool special and provide details about other specials found on our website.